Jacob Bazeley has had a very profitable 2012, with six final table appearances and more than $ 500,000 in tournament winnings. The Cincinnati native has racked up more than $ 1.7 million in cashes in his career, with his combined live and online tournament winnings. Bazeley also had an impressive second place finish at this year’s World Series of Poker. Currently sitting in 54th place in the 2012 Player of the Year race, the Midwesterner fielded a few questions about his opinions on online poker versus live poker, misconceptions of the poker lifestyle, and why some people are just sore losers. 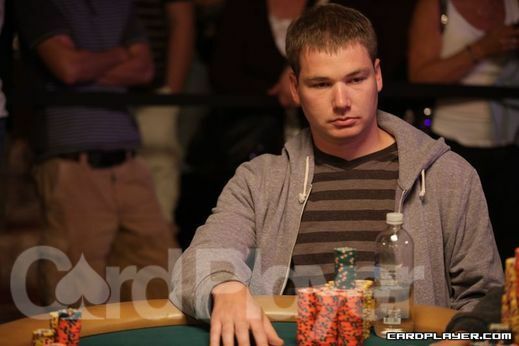 Logan Hronis: Tell us about your rise to becoming a poker pro. Would you say your experience was an overnight phenomenon or more of a gradual grind? Please explain. Jacob Bazeley: Well, I started, like most kids my age (29), with home games with buddies. My college roommate introduced our basketball team at Christian Brothers University to poker. I progressed from the $ 5 and $ 20 home games to the casino in Tunica, MS, which is 40 minutes south of Memphis. I read books, mainly on limit hold’em at the time, since the (limit) games were good in Tunica. I went from the time I was 19 until I was 22. I had a great fake ID. I was coming up from the $ 4-$ 8 limit game to being one of the regulars in the $ 20-$ 40 limit game at the Horseshoe in Tunica. Some time around 22, I met a couple kids from Ole Miss who got me into no-limit and more importantly no-limit tournaments online. We started hanging out and playing online poker together soon after. Back then, we were playing small stakes — maximum buy-in $ 109 on Bodog and occasionally Party Poker and Full Tilt or (Poker)Stars. But we always had under $ 10,000, and were really just learning the ropes. We were going broke from time to time, borrowing or getting backed, and getting a score to be back. There were a lot of great memories from the days when I was clicking buttons and learning from my own mistakes. Meanwhile, I was watching videos online on Poker X Factor. They had a lot of good pros at the time who taught me the thought process behind their decisions. I soaked as much in as I could and experimented. Eventually, I became a regular on the main sites, always with my own money. Grinding up the ladder, it took years, but eventually I was making good money. I finally got a big score in the way of a fifth place in the FTOPs main event in 2008 for $ 103,000. I haven’t looked back since. LH: Talk about the poker scene in Cincinnati, and Ohio in general. Do you think the new casinos in the state will have an impact on the popularity of poker, in general? JB: Cincinnati is kind of a weird place for me. I don’t play much poker when I’m there. I play so much on the road, that when I’m home I hang out with family and friends for the week or so I’m home. Right now, the only casino is in Lawrenceburg. The action stinks mostly. But I’m hoping that once the Horseshoe is built in downtown Cincinnati, the action will be nice. Horseshoe is typically a well-run casino for poker. I hope it has good action, and I will definitely be spending more time there. LH: You have more than doubled your live winnings from 2011 to 2012. Would you say you are playing better poker this year, overall? JB: I’m very confident in my game. I have always been. The run I made in the $ 1,500 Event No. 2 at this year’s WSOP kind of felt surreal, but at the same time it felt like it was supposed to happen. All the decisions you make at the table are made based off things you learn in the past, or things you pick up off your opponents. I have spent so much time on poker, I was just waiting on my moment to make the right decisions for good money. Before this event though, I had not cashed in three months of live poker. I was on my own, but because of the downer, I had to get a backer for the WSOP. I have a lot of great friends who have confidence in me. Two of them, Jacob Naquin and Tim Krank backed me in that event. I couldn’t have played on my own, I was hurting for money, and had to keep some life money for myself. Because of the opportunity I had from them, I made that run. It felt great to be in that spot, and even though I was low on money at the time, I still felt very, very confident at the table. I feel like I’m getting better every day, and I better be, because the game moves fast. LH: What do you see as the major differences between the online and live tournament settings? Do you prefer one, compared to the other? If so, why? JB: The biggest difference between online and live is, well, everything. (Playing) live, you have to deal with people at the table, dealers, floor men, and any of them can ruin your day, at any point, in a variety of ways. I have seen some ridiculously embarrassing behaviors by players live that make you laugh at them or want to fight them. But I have also met nice people who chat it up and have a good time playing cards. If everyone could be as nice as the people are in the Midwest and South, it would be great. But you have to go to rough areas of the country where people are generally more confrontational, like Atlantic City, Vegas, and L.A. People in those places want to fight you when you beat them in a pot! (Laughs) It’s a game, calm down guys. With online poker, you get to choose who you hang with. Play solo, or with one buddy or a group of six, it’s your prerogative. You control what music you hear, the TV you watch. You also get to play as many tournaments as you want in a day, instead of relying on one or two a day, like most live tournament series. Plus it’s more expensive live. Hotels, food, flights, taxis, massages, cocktail tips, etc., all add up. Online, you can live way cheaper. LH: Can you give us a little insight into how important bankroll management is to you, personally, and what strategies you implement with your roll? Would you say these strategies were learned from advice, experience, or otherwise? JB: Bankroll management is definitely important. You have to be able to step down stakes and take them seriously in order to succeed in this game. Everyone is going to go on a downswing, and needs to reevaluate some things in their game, and play “easier” tournaments for a while. But, at the same time, almost every highly successful poker player is a slight degenerate. You have to have gamble to succeed in poker. Money has to mean close to nothing to you, on the felt. However, you have to be somewhat smart with money, off the felt. Some people spend outlandishly, and downers happen all the time. Be prepared for bad things to happen in poker, it is a brutal game. Be honest. Are the tournaments too tough, or are you just playing bad? Is it all bad luck, or a combination of more things? This game requires constant reevaluation, and people who don’t probably aren’t getting much better. LH: Being a professional, and living the poker lifestyle, what are some common misconceptions about playing for a living? Are there any mistakes you may have made? JB: The poker lifestyle has many misconceptions. It’s usually because of videos of some players, or movies about gamblers. To be honest, the general public is pretty uneducated about our profession. They, with their blinders on, look at poker players the same way as a blackjack or craps player. It’s pretty sad that people don’t open their eyes more to see what we do for a living. People love to play card games — always have. This is the only profession in the casino where you get to take money from the other players at the casino. This is why it is profitable. People don’t understand that. I’m not playing versus Harrah’s, I’m playing versus Wilmur from Arkansas who plays twice a week. If you have more experience and mental capabilities than the players you are playing against, then you have a good edge. Some poker players do live outlandish lifestyles because they have a lot of money. But the majority of them don’t live like that. Some try and fake it, but it never lasts. I’ve been to some unreal places, but also some absolutely miserable places. So, it’s give and take. I just got to go to Hawaii because of poker. A buddy won a tournament, which we said that the prior winner had to take the other to Hawaii. But I also went to Council Bluffs, Iowa cause of this game. The biggest two mistakes I made were backing players. I lost most of my bankroll at the end of 2010 doing it. I also dated an unfortunate girl when I was coming up in the game. I should have been free to explore the poker world. Poker and most girls, especially needy ones, do not mix. My current girlfriend is supportive of me in every aspect. She lets me travel, and is confident in herself and has her own life that she’s living. But I am lucky. You must pick your girlfriend wisely, as a poker player. Be wary of girls in casinos, they see money all day!